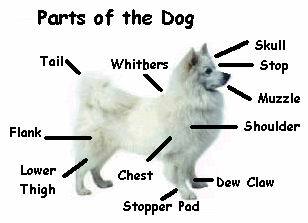 The American Eskimo Dog (Eskie) is a "Spitz" type breed of dog. The Eskie whose ancestry can be traced back thousands of years, has more directly descended from the German Spitz. Though the German Spitz can be of different colours, Eskies are always white or a biscuit white colour, with "sharp black points" highlighted in their nose and eyes, while their ears are alert in high pointed style. The United Kennel Club (UKC) has recognized the Eskie since the early part of the 20th century, while the American Kennel Club (AKC) has only recognized the breed since the mid 1990s. The Eskie can be any of the three varieties, or sizes: Toy, Miniature and Standard. The AKC recognizes all three sizes. The UKC only recognizes Miniatures and Standards. The Canadian Kennel Club (CKC) members voted to recognize the breed in the Non-Sporting Group in 2005.